You are here: Home / Audio Programs / Communication & Language Programs / Speaking & Charisma / Converse with Charisma! Comments Off on Converse with Charisma! How to Talk to Anyone and Enjoy Networking featuring Jim Rohn, Dianna Booher, Brian Tracy & more in this powerful 8-part Audio Series. This audiobook is packed with 5 hours of expert training on how to converse with confidence, with viewpoints from 8 leading authors on communication skills. Have you ever been to a party or a work function where you don’t know a soul in the room? 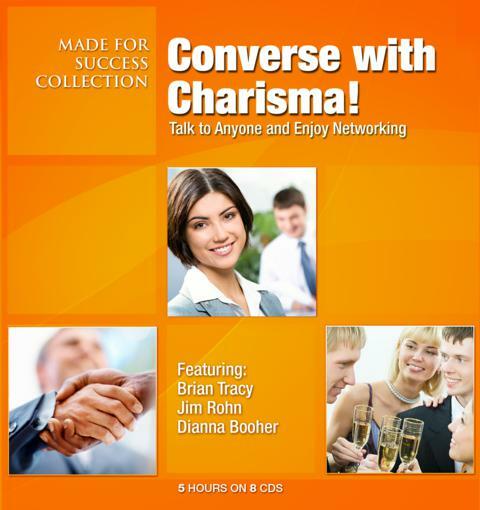 Learn how to strike-up a conversation with anyone and be the hit of the show! Anyone can master the art of business networking. This audio series is packed with resources to help you learn to think on your feet, overcome anxiety and work the room like a polished professional. Whether you need to learn small talk or networking, this series will teach you the actionable skills to attain your business goals at any networking event, cocktail party, dinner or company outing. This series will equip you to unlock your hidden potential to network with ease and grace. The self-study program lets you learn at your own pace, during your commute, in the gym or in the comfort of your home. • Speak to anyone, anywhere! COLETTE CARLSON is a professional speaker, author, and communication-skills expert that encourages women to speak their truth; to say what they mean and mean what they say to save themselves time, money, and sanity.